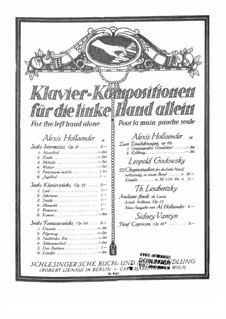 “Six Piano Pieces for the Left Hand”, also known as “Six Intermezzos for the Left Hand Alone” is a sheet music collection of six music pieces for piano solo by Alexis Hollaender. 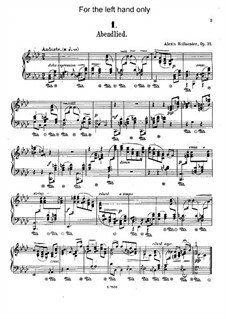 The pieces are considered to be upper-intermediate to advanced level of difficulty, each of them is one to maximum six pages long and demands a good control of the keyboard. The works were written in the Romantic style, being quite imaginative, attractive and fun to play. The moods vary from lyrical and expressive to intense and dramatic, the tempi are also diverse. The pieces are: 1. Evening Song (Abendlied) in A-Flat Major 2. Etude in E Minor 3. Melody in A Major 4. Waltz in C Major 5. Perpetuum Mobile in C Minor and 6. Hunting Song (Jaglied) in E-Flat Major. This set will suit those who play left-handed as well as the right-handed players who want to challenge their other hand and develop the skill of playing the left hand alone. Perfect for upper-intermediate student at the recitals. I've never paid enough attention to my left hand performance abilities and it's a shame I must admit. The set really is helpful for setting the right technique and it's a great exercise for the brain too - as a right-handed person I found it quite complicated to completely shift the focus at the very beginning. I would say that Hollaender's pieces are meant for advanced players only, as an upper-intermediate I had to fight with the first two a bit. Anyway, thanks for the nice collection, it's a very useful work for all pianists, one way or another. os clientes que fizeram donwload "Six Piano Pieces for the Left Hand, Op.31" também fizeram download.